By Garnet Hertz, Adjunct Faculty, Thesis Advisor. 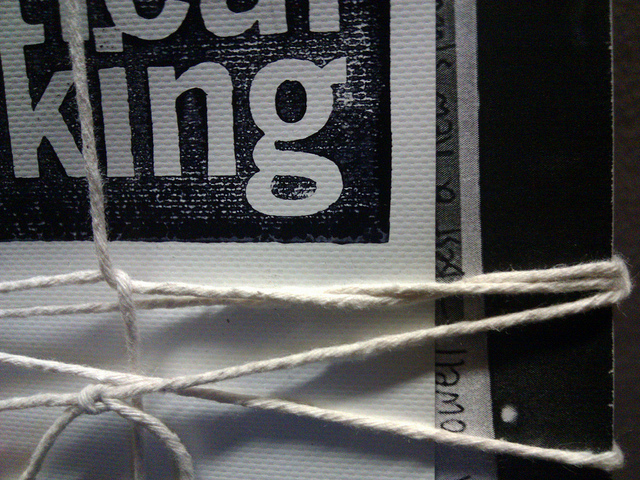 Today I shipped off the first copy of “Critical Making” — a handmade book project that proposes that makers need to be critically engaged with culture, history and society, and that hands-on physical work — making — has a clear place in enhancing and extending the process of critical reflection. The project started out as a Facebook post asking people to submit short two-page zine-like pieces that responded to the concept of critical making, a term that Matt Ratto had coined several years ago. I was interested in bringing together a cluster of things under that banner: maker culture, critical technical practice, hacking, tactical media, art and technology, critical design, zines and experimental publishing. 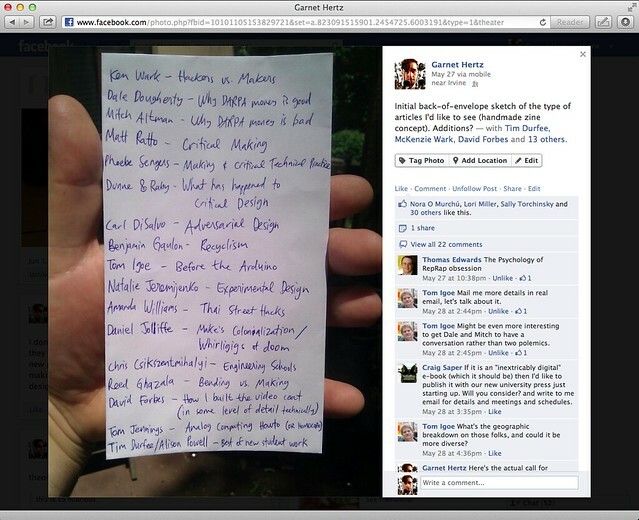 I drew up a “dream team” table of contents on the back of an envelope, took a photo of it, and tagged/posted it Facebook. I had initially thought of the project as a zine, but it soon grew beyond this: after a few key people — like Ken Wark — confirmed that they’d submit content on Facebook it quickly grew. I ended up with sixty people submitting over 300 pages of original content that ranged from academic essays, highly technical descriptions of projects, documentation of artwork, interviews, physically cut-up layouts and pages dripping with ink. Because so much content was submitted I decided to split the project into multiple booklets around specific topic areas: Manifestoes, Projects, Science, Terms, Conversations, Make, Places, History, Childhood and an Introduction. I finished the first rough test copy of the project on September 12th — some photos of it are here — it turned out better than I initially expected, but I soon discovered that producing a single set is very different than producing a run of 300. I committed to printing and giving away 300 free copies of the project — which is 3,000 zines with 10 in each set. Roughly speaking, this is a stack of zines about 18 feet tall weighing about 300 pounds. I got a quote for printing it at a copy shop, which was $5,000 for just the black and white content (105,000 pages, 4-up on 26.5K pieces of 8.5″ x 11″ paper). To avoid this cost, I ended up managing to talk my way into getting a malfunctioning photocopier for free, and spent a couple of days hacking through the security on the copier and fixing it. Folding over 100,000 pages by hand took a considerable amount of manual labor, and I still need to staple and manually trim almost all of the books. Geert Lovink asked me what the purpose of me printing, binding, cutting and distributing the project myself — especially with publishing now being arguably easier and cheaper than ever before. Generally speaking, my time is expensive — why not just get somebody else to do it? It’s a fair thing to generally ask: what’s the value of doing something yourself? During the production process, I think three things became apparent. First, doing something yourself as a non-expert is a crash course in understanding how something actually works, and it is the fastest way to unpack and learn about the things that would normally remain invisible and taken for granted. The process of being humiliated by things that you think are easy or mindless is a valuable experience — I generally think that innovation occurs out of porting your ideas and processes into a field that you’re not familiar with, and actually doing this on a regular basis is a crucial part of practicing inventiveness. The second thing that became apparent is that there is an obvious push against e-books occuring, and that the interest in the project is partially fueled by the format of the project as a photocopied and handmade zine. I see this as part of new wave of postdigital print — like McSweeney’s or Visual Editions — that is vigorously exploring the value of the printed page. Crunch Lunch with Garnet Hertz from Annenberg Innovation Lab on Vimeo. The third thing that became clear is that there is a large community of people involved in “making” that has little in common with Make by O’Reilly. In my case, a flood of people came out from academia and the arts that had something in common with the concept of critical making—that hands-on physical work has a clear place in enhancing and extending the process of critical reflection. Garnet Hertz will be teaching a series of 4 seminars based on Critical Making as part of the Spring 2013 course called Critical Frameworks.